The 570S Coupé, the first car launched in the Sports Series range from McLaren Automotive, has been announced as ‘Best Premium Performance Coupé’ at the Middle East Car of The Year Awards (MECOTY) 2016 in Abu Dhabi. 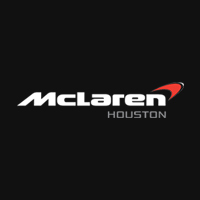 The result marks the fourth time McLaren has been commended at the prestigious Awards in only five years. The latest silverware completes a hat-trick of awards for the 570S Coupé, following recent trophies for ‘Best Sports Car’ at Wheels magazine’s Car of the Year 2016 awards and the highest accolade of ‘Best of the Best’ at the prestigious Red Dot Award: Product Design 2016 awards. The internationally renowned awards were judged by a highly regarded independent jury of 41 members, and celebrate the aerodynamic focus of the 570S Coupé which introduces the McLaren design language to the sports car segment for the first time. The search for the MECOTY Best Premium Performance Coupé 2016 began in December last year, with an objective appraisal of any new models launched in the previous 12 months. The extensive assessment process by the MECOTY judges, which is made up of some of the region’s most highly regarded automotive journalists, subjected the McLaren 570S Coupé to a range of road testing, both in the region and in the UK, with the car benchmarked against an in-depth bank of key criteria including design and quality, handling and drivability, performance and capability, safety and durability, as well as emotional appeal and driver satisfaction, among others. The finalists were shortlisted in mid-March and the winners presented to an industry audience at the Middle East Car of the Year 2016 gala dinner award ceremony, held at Abu Dhabi National Exhibition Centre on 31 March and attended by all major automotive manufacturers from the Middle East. The ‘Best Premium Performance Coupé’ award was presented to Andreas Bareis, Managing Director of McLaren Middle East & Africa. The McLaren 570S Coupé is part of the Sports Series and introduces the McLaren DNA, including a lightweight carbon fibre chassis and race-derived technologies, to the sports car market for the first time. The 570S Coupé is fitted with a mid-mounted 3.8-litre twin-turbocharged V8 engine, which has been developed to be responsive and thrilling even at low engine speeds. As its name suggests, a dedicated application of the award-winning McLaren power unit generates 570PS (562HP). Upon receiving the award, Andreas Bareis, Managing Director of McLaren Automotive Middle East & Africa commented: ‘On behalf of McLaren, I am delighted to have received the Middle East Car of the Year award for ‘Best Premium Performance Coupé’. 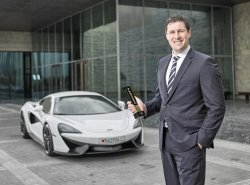 This latest accolade makes a hat-trick of prestigious awards for the new 570S Coupé in the region and reinforces the commitment to innovation, quality and exclusivity at McLaren. The sports car market is hugely competitive, and to secure such a prestigious award with the first model into this important segment is a superb achievement.